I’m writing to inform you of an opportunity for emerging documentary producers in Brooklyn, NYC, called the UnionDocs Collaborative Program. We are earnestly seeking the diversity in perspective that international participants would bring to this alternative approach to media education and production. We understand that you promote and present documentary film projects, and we believe emerging producers associated with your organization could benefit from the opportunities UnionDocs provides. Mentorship toward the production of an original work. Direct contact and structured exchange with visiting artists. Exposure to a wide variety of practices and models. Exposure through a toured exhibition and/or publication of annual project. The first iteration of this year’s UDC project, "Documenting Mythology,” premiered at Doc Fortnight 2010: The Museum of Modern Art's International Festival of Nonfiction Film, and will be presented in Boston next month by The Sensory Ethnography Lab at Harvard University. A wider international distribution effort and tour is planned for the coming fall. Please forward this opportunity to any networks, organizations, or individuals you think may be interested. 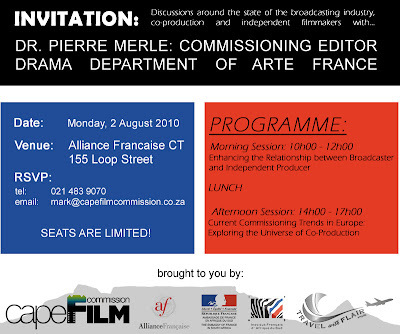 Discussion around the state of the broadcasting industry, co-production and independent filmmakers with… Dr. Pierre Merle: Commissioning Editor Drama Department of Arte France. We would like to schedule a meeting with those DFA members interested in assisting us with moderating Q&A's. We think it will be better if we all meet (for a very short meeting) and select the films we are interested in, as well as to provide you with DVD copies should you wish to view the films ahead of the screenings. The proposed time is Tuesday, 5pm at the Encounters office - 1st Floor, 27 Caledon Street. Please kindly forward this message to other interested members and I look forward to your support.